What does Jamaica’s most celebrated young Reggae artist desire for his Birthday? “Chronixx tickets sold out already!“ was the response we got before we were even able to ask a question or open the door to Natural Touch Cafè in Liguanea, Kingston, a Veggie Restaurant which was supposed to sell tickets for that night’s Chronixx concert. Trying our luck a second time at Viva Juice, another ticket outlet at the Bob Marley Museum, would leave us satisfied with a spirulina flavored juice, but again... no more tickets available. Those who did not have a ticket now had to be very eager or very creative to get in. As early as 7pm, the crowd would gather around the gates of Skyline Levels: one of Kingston’s most mystical concert venues, located at Jack’s hill, a few hundred meters down hill of Gabre Selassie’s world famous Kingston Dub Club. While some fortunate ones successfully lined up for the last handful of tickets sold through the fence, the majority had to enjoy the concert form outside the venue. After a series of fortunate events, we would soon find ourselves in the V.I.P. area enjoying the breathtaking view over Kingston while eagerly waiting for this highly coveted acoustic show to begin. Around 11pm, Zincfence Redemption’s extended percussion and drum section finally opened the night, much to the delight of the international audience packed in front of the stage. The band built up a 10 minutes bass and drum jam session that was soon accompanied by guitars and keys, as well as Teflon on turntables. A sudden sea of smartphones made it very clear that Chronixx’s had arrived on stage. Just like on the release “Dread and Terrible,” the powerful first verse of Alpha & Omega opened the performance with a bang. The diversity of the massive would soon gain another dimension through Chronixx revealing the fact that among the numerous members of the Zincfence family, some high-ranking members of the Jamaican government had also found their way to Jack’s hill this night. Grateful for the opportunity to perform right in front of the politicians, Chronixx commented: “It is very commendable that you are here, and di people dem haffi know dat. And since uno here, uno hear a lot of things tonight that may be important for the leadership of this country.“ After this statement, the song Capitalist featured by Infinite came across very serious and close to reality. At midnight, the crowd struck up with a spontaneous Happy Birthday. Chronixx then got the opportunity to communicate his message directly to those people who have the power to make real social, political, and economic change in Jamaica. At moments, the crowd gave big forwards to the singer’s jokes about the government’s inability do deal with the current water shortage. 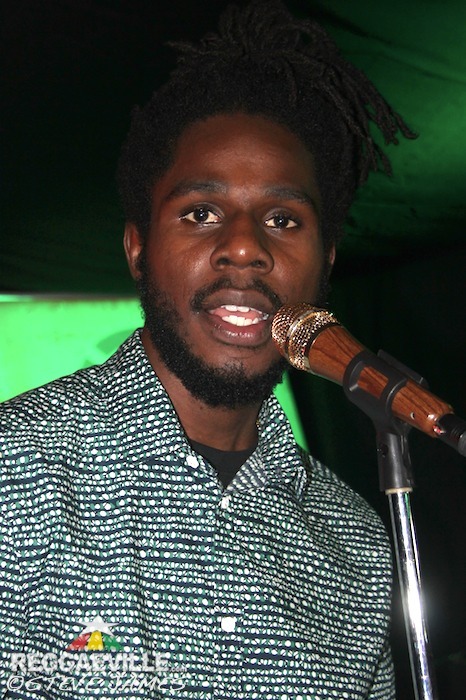 However, the mood got serious again when Chronixx eventually commented indirectly on David Cameron’s statement that Jamaica and Britain should move on from slavery. After recently being critiqued on social media for his silence, he said that “reconciliation plays a great role in reparation, reparation is a heart thing, and it is important that the ones that were wrong admit that they were wrong.“ He brought to attention that Jamaica is too small to be divided into uptown and downtown, and that it had enough fertile ground to feed the tourists and the population with the various fruits and vegetables that naturally thrive on the island. A spontaneous freestyle lightened the mood when he joked about the precarious ticket situation for the event, making “de people dem aks weh di ticket dem sell” a chorus. Iba Mahr, Dre Island and Keznamdi, all bussed their most famous tunes and Silkki Wonda & Jahkime presented their new Single Black Marcus. Here Comes Trouble and Like a Whistle got the audience buzzing when performed at this breathtaking setting where the air was filled with ganja and incense smoke. Chronixx humbly admitted that whenever people ask him how he feels about being entitled a reggae artiste, his answer is “I feel very small, because reggae music is such a big thing.” Confessing his love for cartoons and film music, he stated that no matter which genre a Rastaman tried, it would always turn out reggae. “Rasta cyaa do Hip Hop, Rasta cyaa do Rock. Everything we try, end up reggae.“ After taking some extra time for so much talking around 1am and after tunes like Capture Land and Spirulina, the artiste bigged up all proud Jamaicans with his anthem Smile Jamaica. He eventually left the stage around 2am, when the players of instruments entered a typical Jamaican ending by leaving the stage one after another. 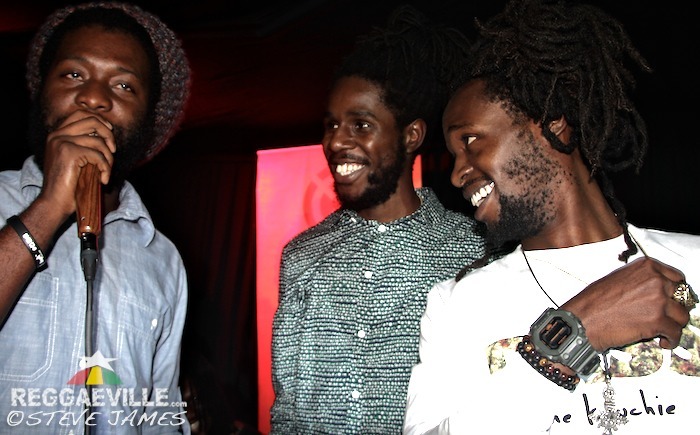 As the last note was falling silent, Chronixx and friends began an extensive meet and greet session with their fans in this very informal yet intimate setting. What else could Chronixx possibly have desired for his birthday? I am pretty sure that both audience and artistes alike - and hopefully also a hand full of Jamaican MPs - will equally keep in mind this unforgettable 10th of October on Jack’s Hill. … Happy Earthstrong Chronixx!